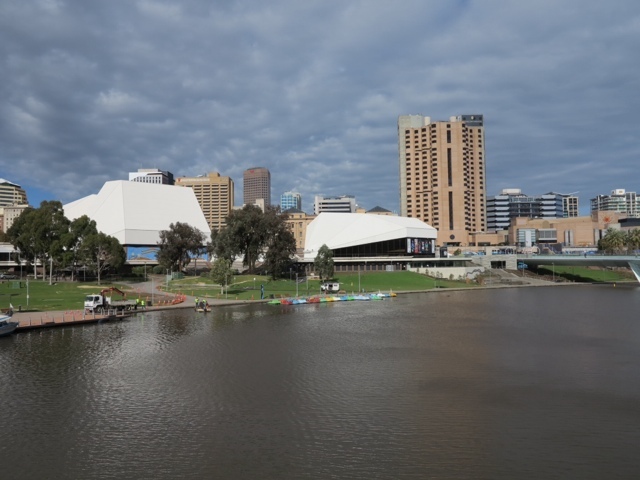 We flew to Adelaide for a few days for a special event which has been cancelled due to ill health so we are playing the tourist. The trouble is the weather is windy and cold. We are not used to these temperatures coming from Queensland. Anyway we had a walk around the city today. 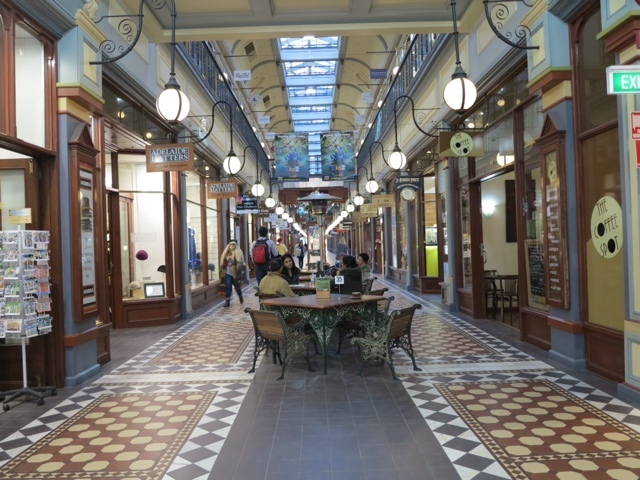 The Adelaide Arcade is beautiful.We are staying at the InterContinental Hotel.We walked across the new bridge over the Torrens River and looked back towards the CulturalCentre and our hotel. 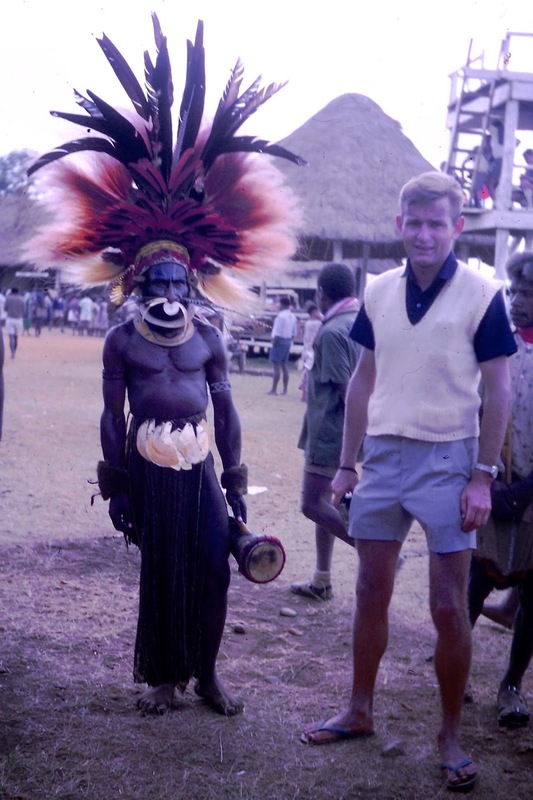 In 1965 I was teaching in Papua/New Guinea. 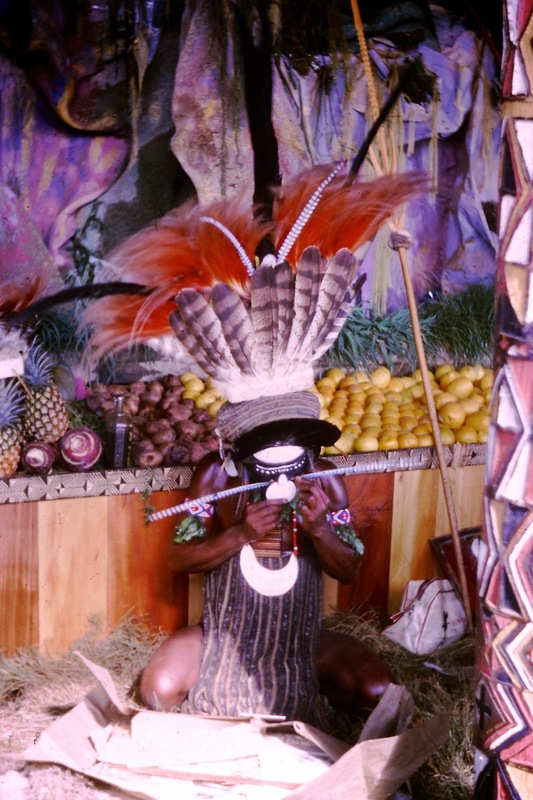 During the school holidays my colleague, Bev, and I booked a tour to see the Mt Hagen Show. 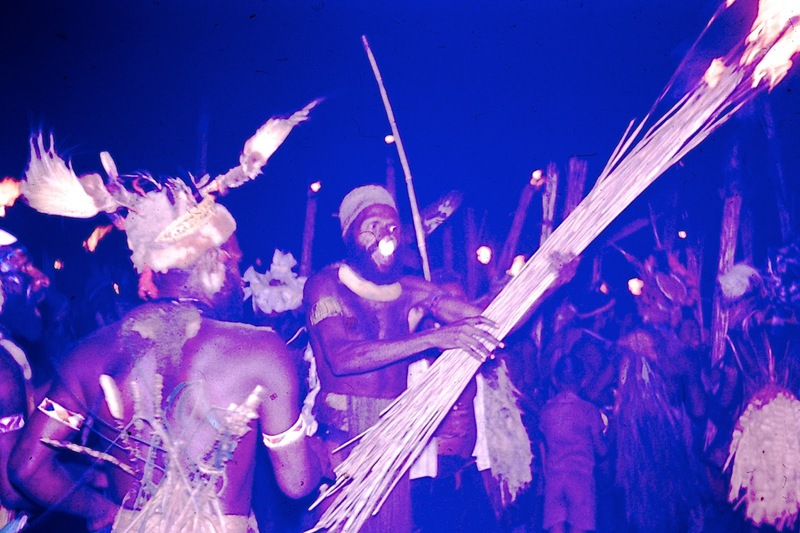 Mt Hagen was a small town in the Highlands where every year the people of the Highlands stage a cultural show. It attracted tourists from all over P/NG. However, the small town was not really geared for an influx of tourists. We had to take our own sleeping bag as our accommodation was community sleeping on the floor of the Govt. Stores building. We ate our meals in a mess set up in the old District Office building. Bev is waiting for me. It is much colder in the highlands than on the coast in Pt Moresby, where I lived. This was my piece of floor space for sleeping. The primitive conditions didn't seem to stop me enjoying myself. 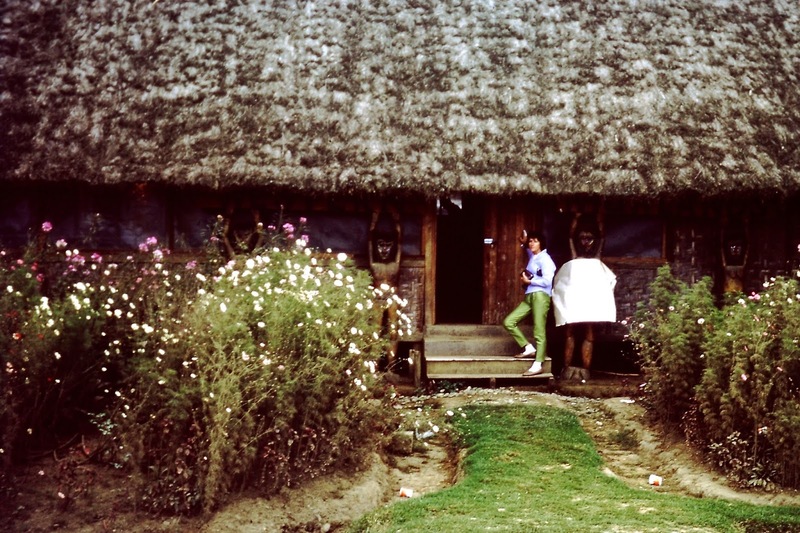 In the agricultural pavilion there were people dressing in their traditional dress and paint for the tribal dances we would be seeing during the day. 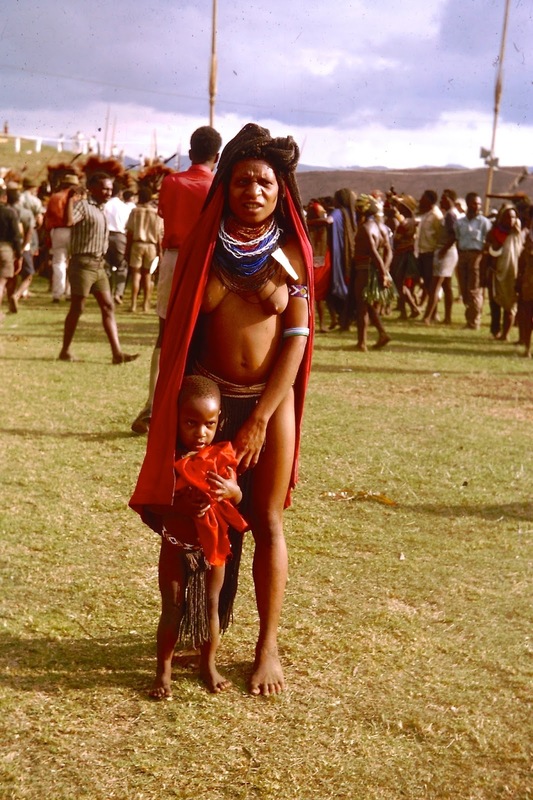 Native people came from many different villages in the mountains. I was surprised to see an axe weapon tucked into a grass skirt. were hand in hand. 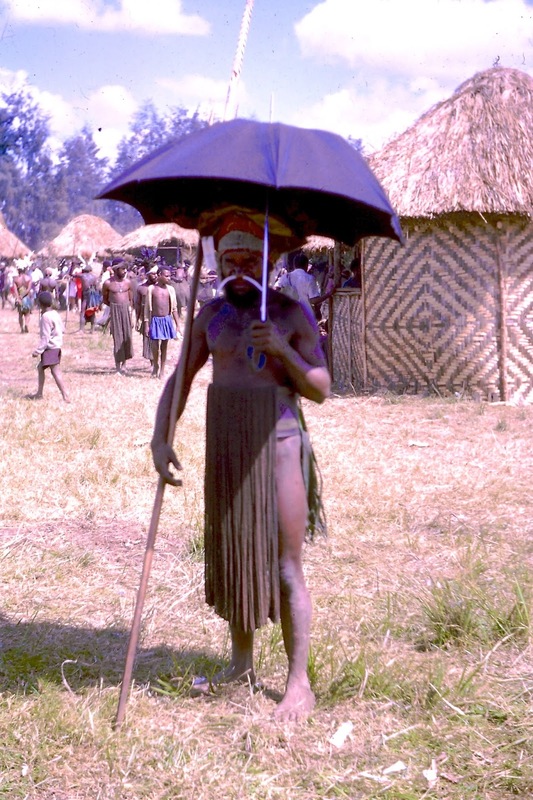 Traditional dress and a western umbrella. 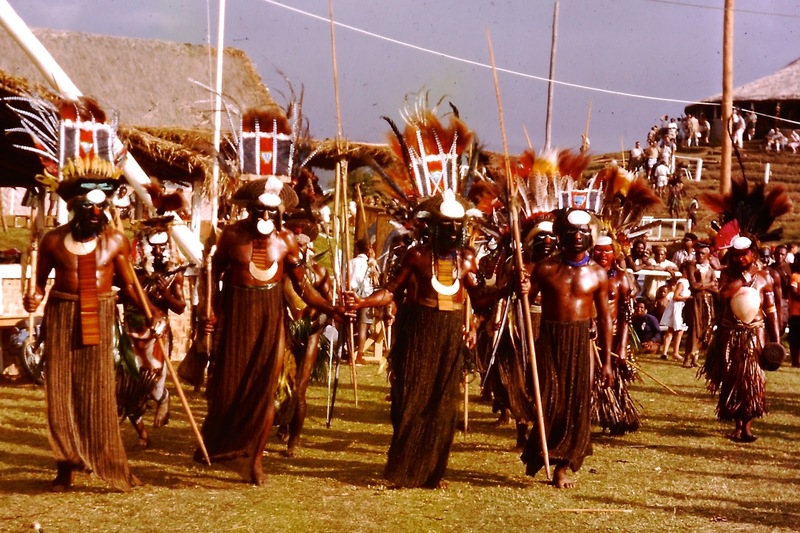 Some of the head dresses were fabulously made from feathers, often Bird of Paradise feathers. The European guy is Kurt, a Swiss artist who was living in Pt Moresby. Shells are rare in the highlands so they became a symbol of wealth. Here they are worn around the neck and through the nose. The girl has a cuscus skin around her shoulders. 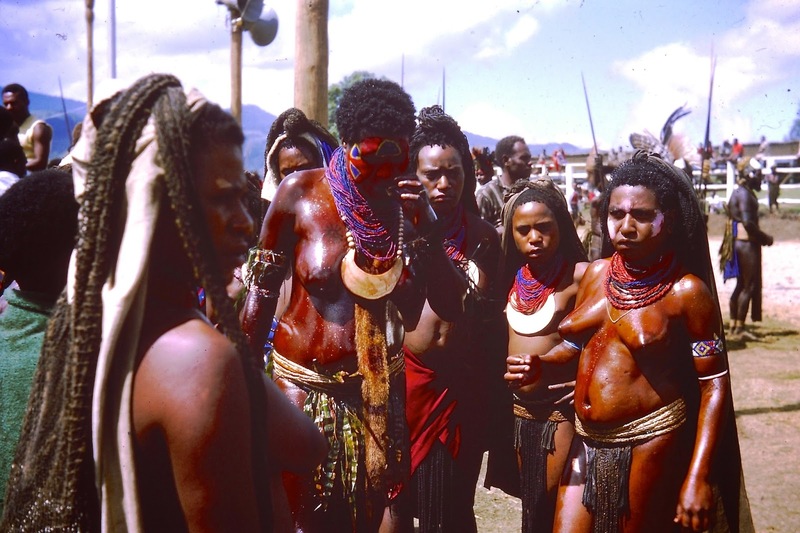 The women covered their skin with oil from pig fat. It was to make their skin look shiny and to keep them warm. 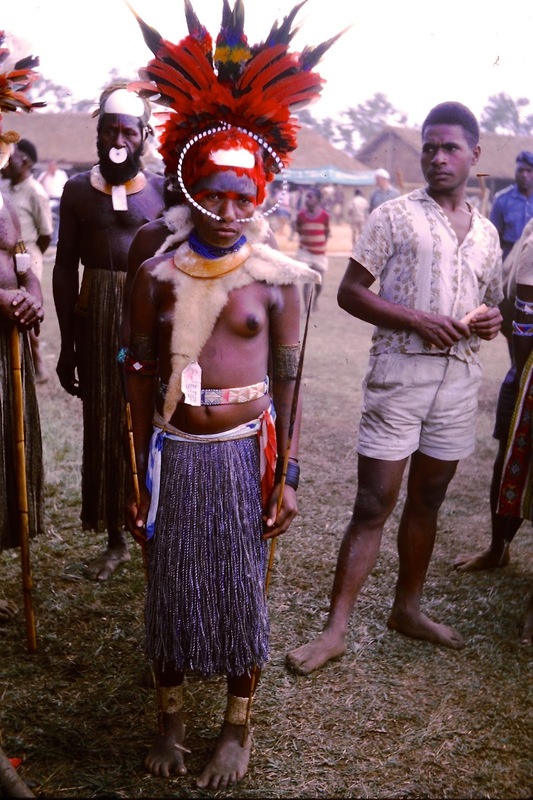 There were many different tribes dressed differently doing their dances. I think these are the Wabag people. 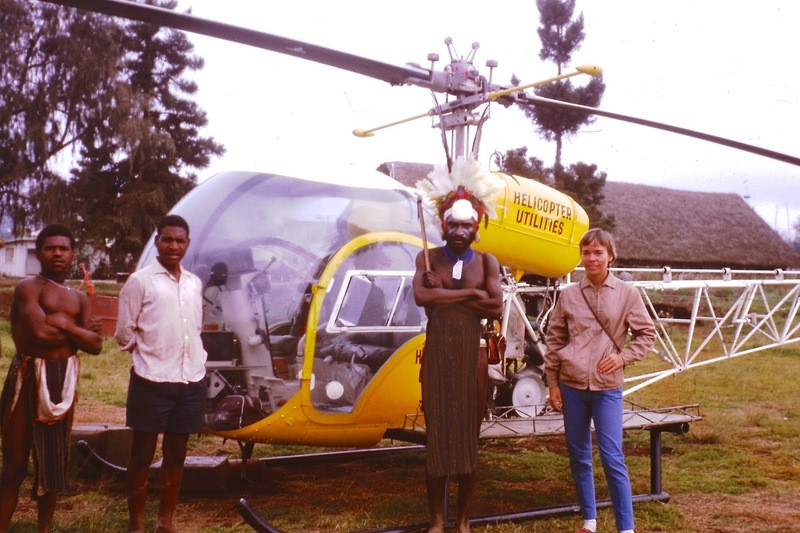 Again I was fascinated to see a stone age man with a then 'modern' helicopter. 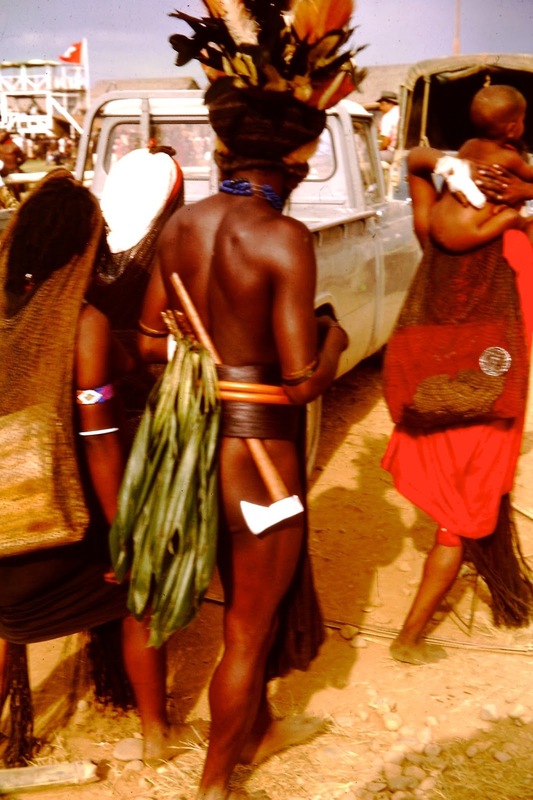 I was a bit nervous standing next to him, they looked very warlike in their traditional dress. 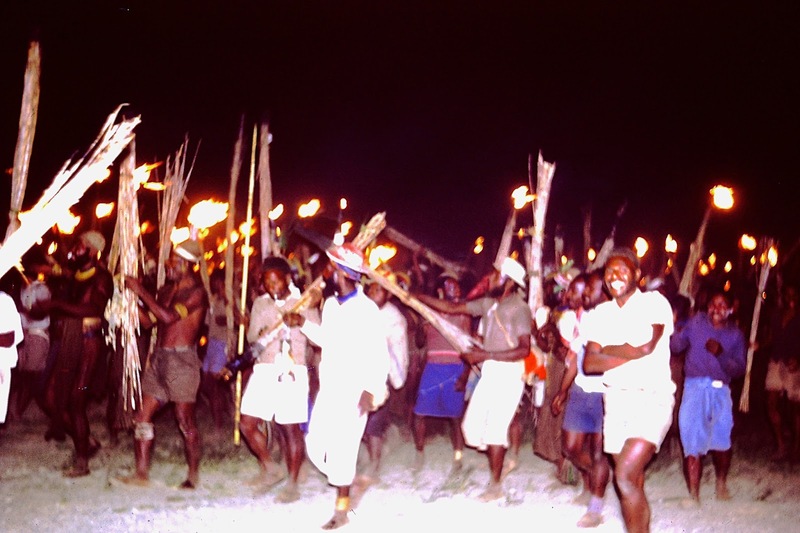 At night there was a torchlight dance of the warriors. 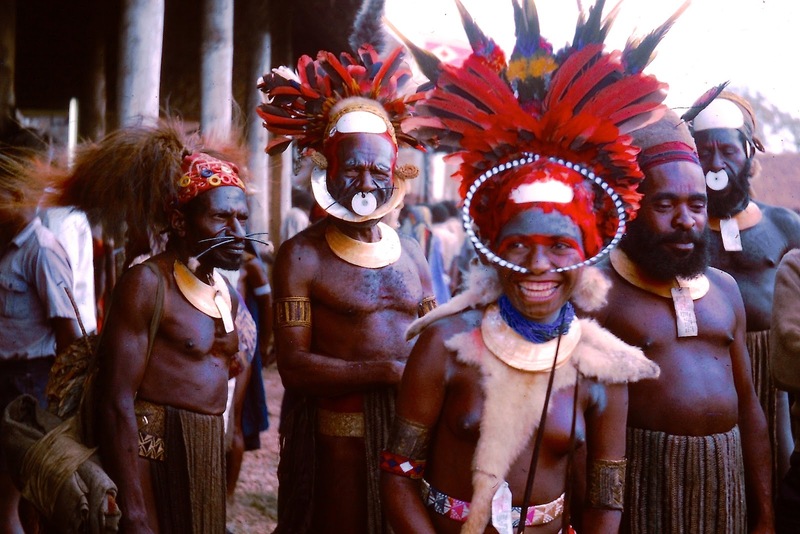 Some of the locals joined in the front of the main group of chanting, singing and dancing tribes. The noise was deafening and quite scary. It was hard to believe they were not really on the war path. We were only there for a few days and then we flew back to Pt Moresby in a trusty DC3 through the valleys and over the peaks of the mighty Owen Stanley Mountain Range. It had been a wonderful experience to see some of the ancient culture of the native people (now called nationals) of the highlands. Last March (I'm ashamed to say) Chris organised a birthday lunch for husband Bob at the Pineapple Hotel in Brisbane. Chris and Bob are our part time participants as they are usually on the road travelling around Australia. However, they were in town for a few months and joined us for some birthday celebrations. 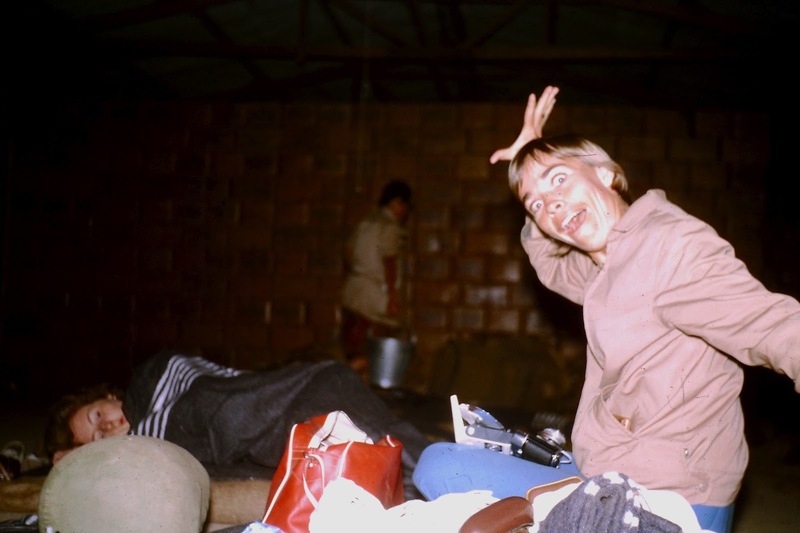 Bob loves his life as a grey nomad seeing the sites and meeting other people at camping grounds. He is a 'Happy Camper". 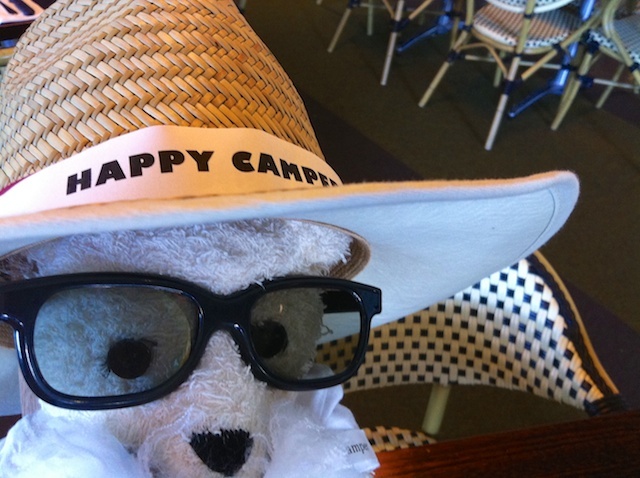 So Birthday Bear thought it would be fun to join Bob at happy hour at the camping ground. 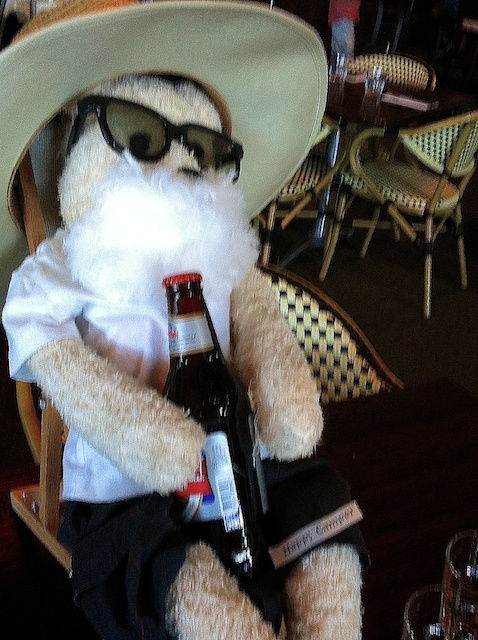 Bear met us at the hotel dressed in his camping clothes and he had his beer ready to share with Bob. Bear also had a big white bushy beard to match that of Bob's. L to R. Paul, Bill, George, Birthday Bear, ( having a snooze in his deck chair), Mary Ann, Chris and Helen. Unfortunately Bob came down with the flu and wasn't able to join us but Chris came to say goodbye as they are off on another camping adventure. 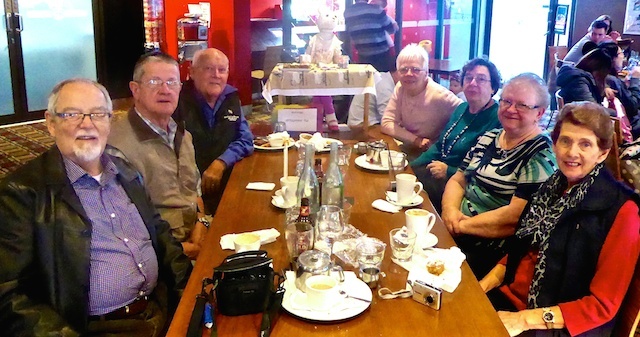 Now skip two months and today we celebrated Mary's birthday at 'The Runcorn Tavern". 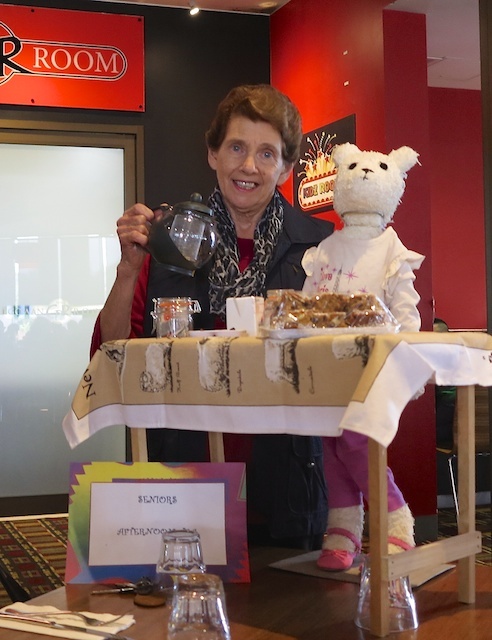 Mary helps at her church providing morning tea for seniors. 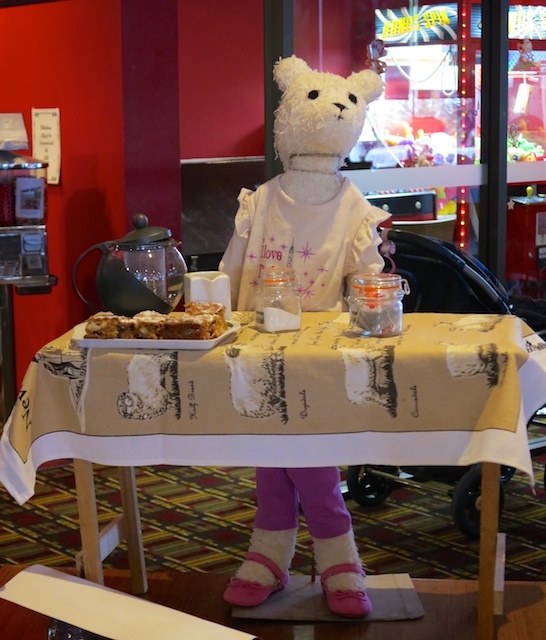 So Bear came dressed in her best and she had a tea pot, tea bags sugar and milk with a beautiful plate of Macadamia slice, which she shared with us. It was delicious. Mary is happy to have a helper for the next morning tea. 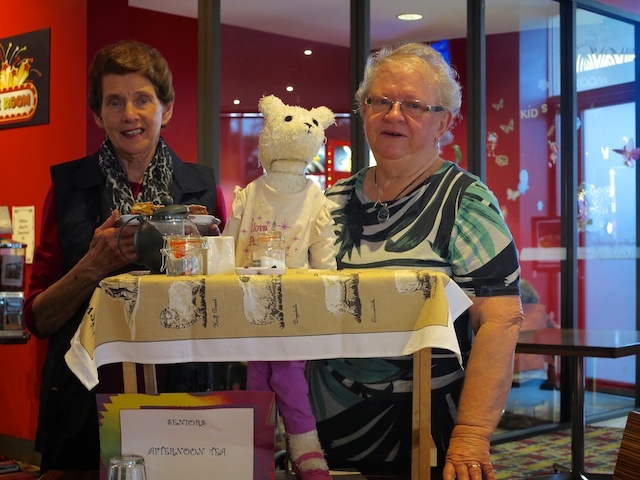 Ann dressed Bear and George made the table. We all enjoyed tea and cake after lunch. L to R. Bill. 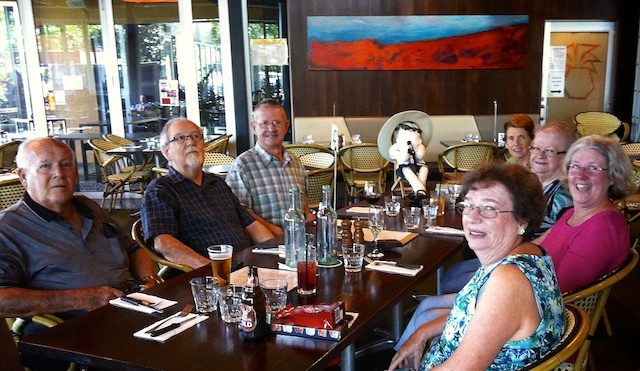 George, Paul, Birthday Bear, moi, Helen, Ann and Mary. We were all pleased to see Paul managed to come even though he is not well and still having chemo and vaccine treatment. Today we went for a photo shoot with our camera club into the city to photograph buildings and monuments. We took the Colonial Heritage Walk so most of our shots were of old buildings. 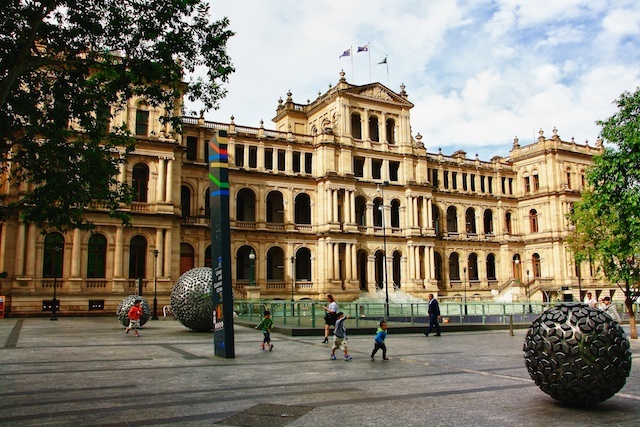 Compared to other parts of the world Brisbane is a young town. The first settlement started in 1823 so naturally our old buildings are not that old. 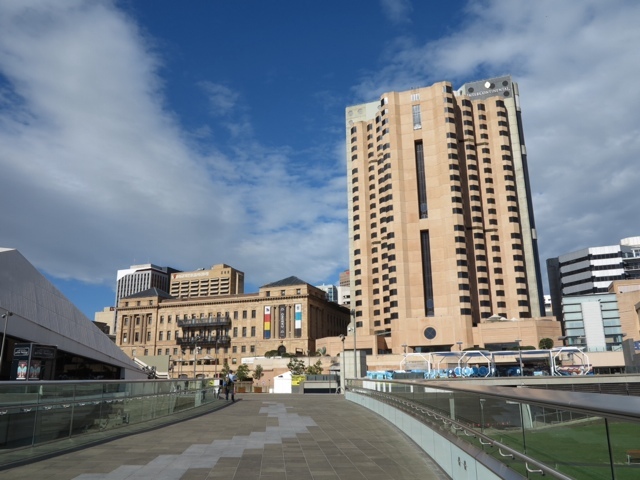 We started in Brisbane Square outside the 'Treasury Casino", which used to be the Treasury Building. It was built in 3 stages between 1883 and 1928. It was designed by J J Clark in a neo-italianate design. Just across the street and through Queens Gardens is the Casino Hotel in the "Lands Administration Building" which used to be the government "Executive Building" designed by Thomas Pye and built in 1898-99. We continued down George St past many more interesting buildings, too many for one post. This building is "The Mansions" designed by G H M Addison and built in1889 in the style of Victorian Terrace houses. They are important because there were very few built in Brisbane. 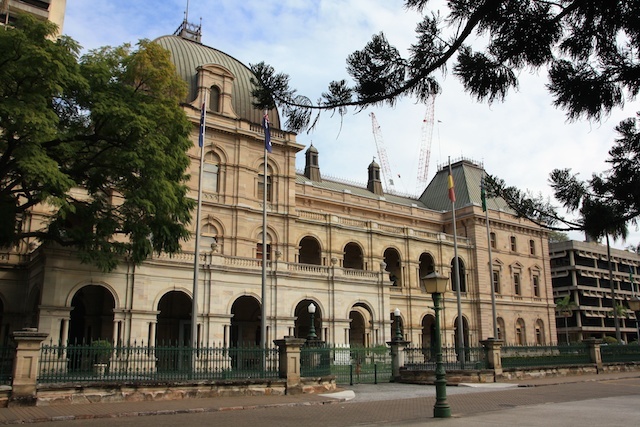 At the top end of George St is Queensland's Parliament House.designed by Charles Tiffin and built in stages between 1865-1889 in a French Renaissance Style. 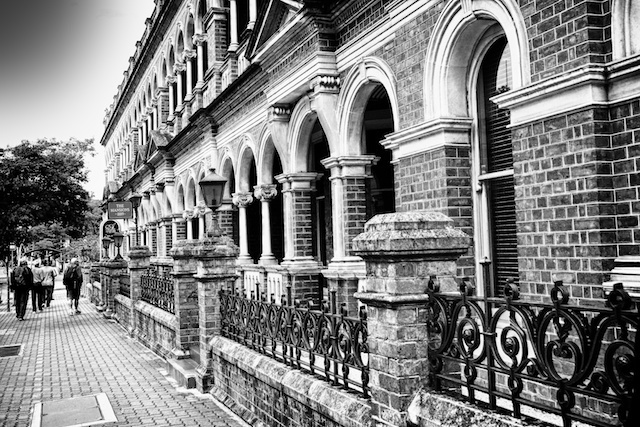 A little further on is Old Government House situated opposite the Botanic Gardens and on the campus of Queensland's University of Technology". 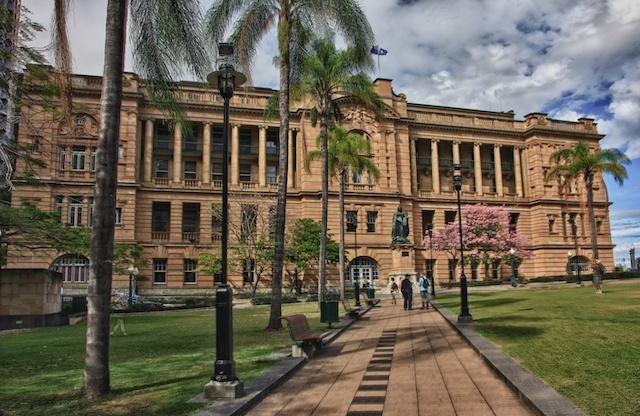 It was constructed between 1860-62 as the home of Queensland's governors until 1910 when it became part of Queensland University until 1972. 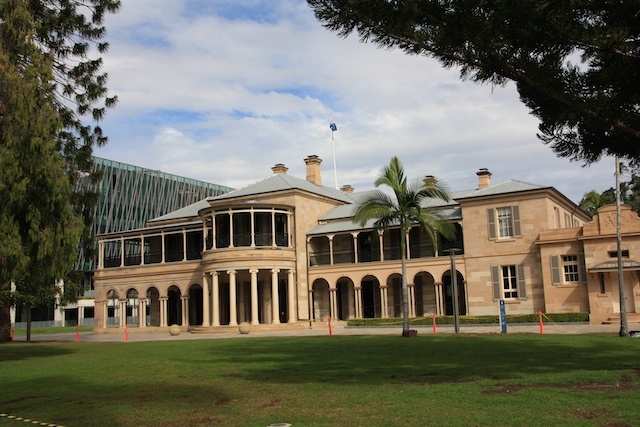 It became the first heritage listed building in Qld in 1978. In 2002 Qld Uni of Technology became the custodians and it is now a museum and used for functions. Behind the old house you can see one of the many modern buildings of the university's Gardens Campus. 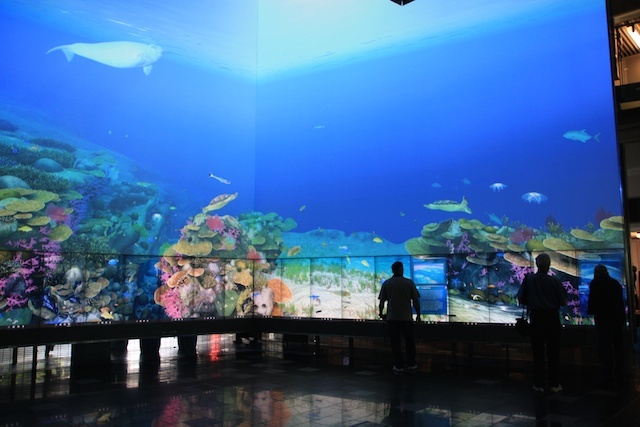 It was the Science Building and we went in to see this amazing digital aquarium where many varieties of tropical fish and mammals were swimming. If you could be quick enough to press the screen on a moving animal it would give you information about it. The Commissariat Stores is the oldest occupied building in Queensland. Built by convicts in 1829. 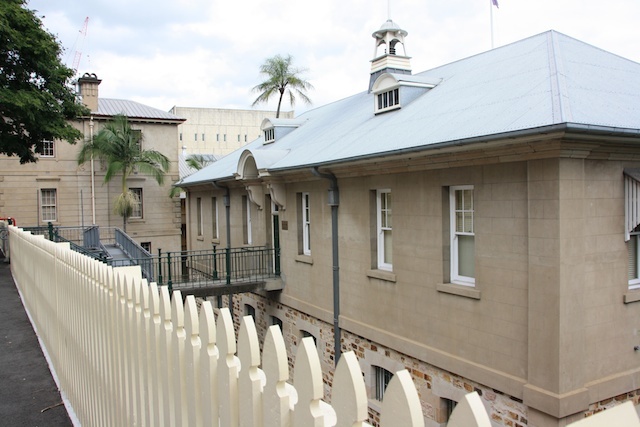 It is now the home of The Royal Historical Society of Queensland. It is beautiful walking weather at the moment, not too hot and not cold. It is hard to believe that it is the first day of winter today. We are still wearing T-shirts. 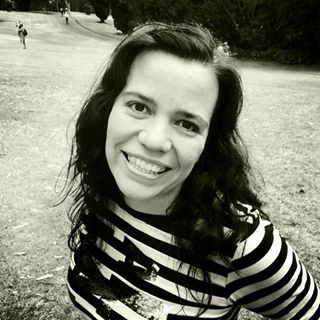 It is Our daughter's Birthday today and 42 years ago she put a stop to a Bayside picnic we had planned. 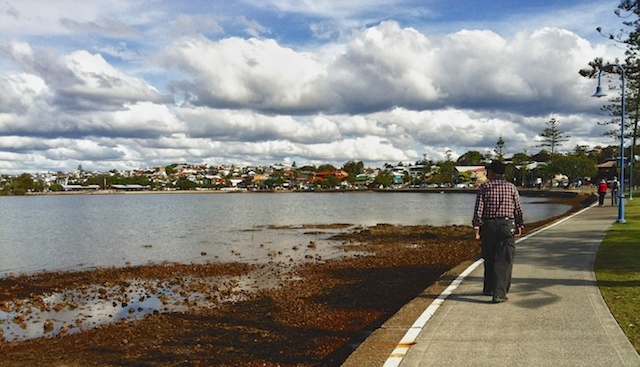 So today I decided we should go to the Bayside suburb of Manly for a walk and lunch to make up for missing out 42 years ago. Happy Birthday Carol-Ann, I would miss a million picnics to have you. TOH doing the Manly walk. 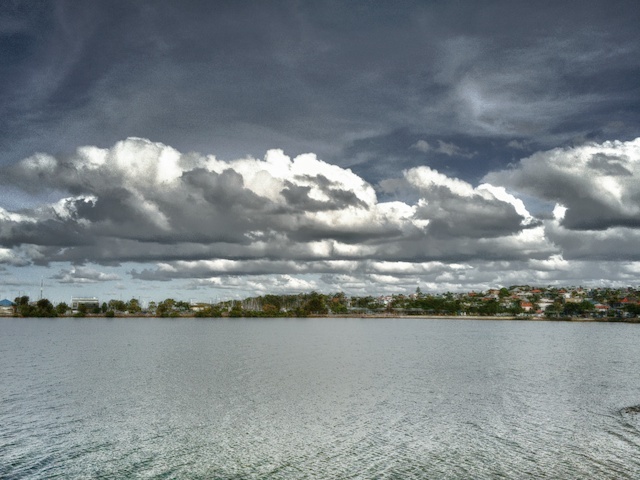 I have had a play with HDR photo processing. 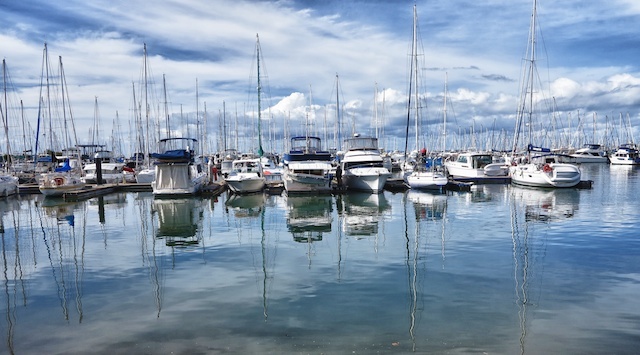 Manly is a Bayside suburb of Brisbane. It has a huge marina the biggest on the east coast. There were hundreds and hundreds of boats. There are many restaurants in Manly Village. This was the view from our lunch table. After lunch we walked further around the bay. I would have liked to go further but you know who wanted to turn back towards the car. 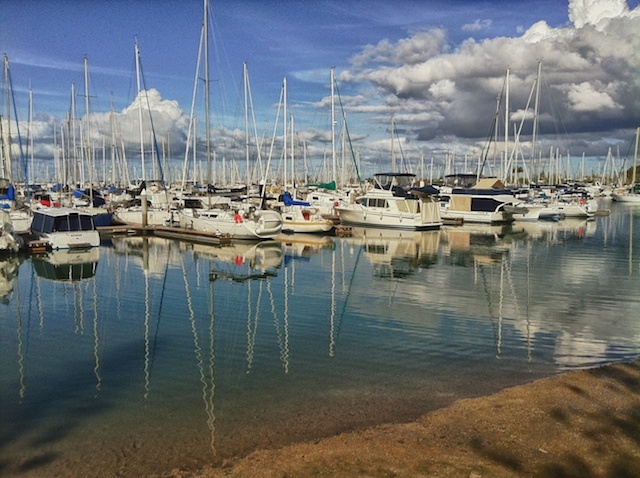 The bay was dotted with white sail boats. 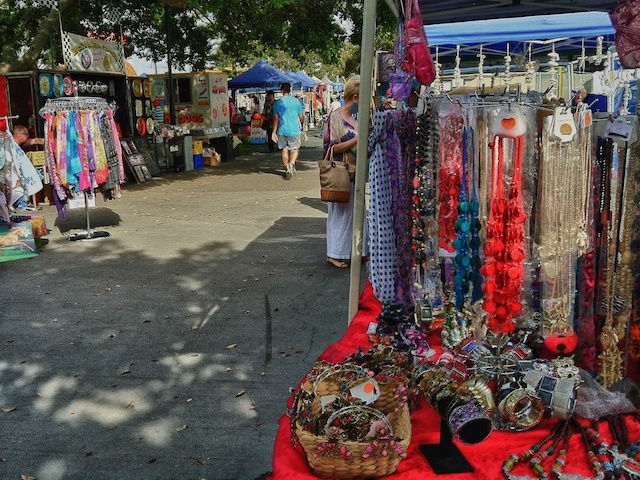 Moreton Bay is 14 k from the heart of Brisbane. 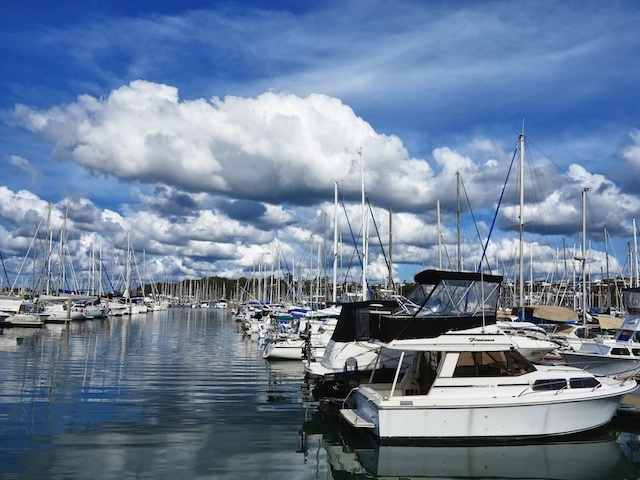 It is popular with recreational and commercial fishermen. It is a shallow bay which allows sea grass to grow and support herds of dugong. Whales also frolic here on their annual migration. 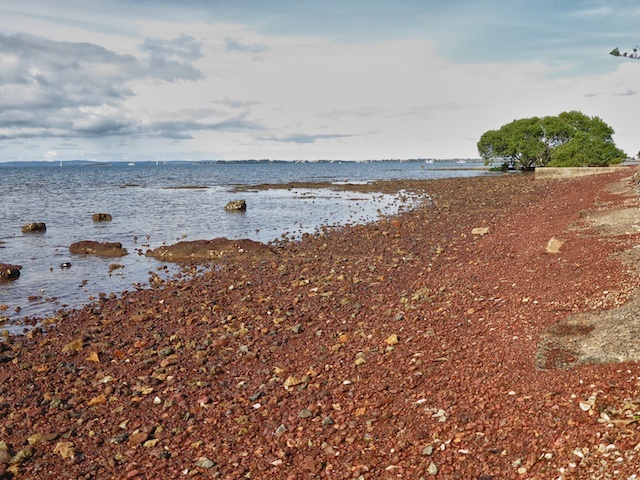 The bay is sheltered by off shore islands and it has a busy shipping channel through to the Port of Brisbane. It also serves as a safe approach to the airport and reduces noise pollution. Obviously it is a playground for boaties. We enjoy the walks and birdlife.